Some parts of the country have more generous selections of apartments than others, and the number of people competing for those finds also varies, according to location. But there are some tips for snagging your dream abode. How close would you like to live to your place of employment? How close to your friends' homes would you like to live? How much space would you prefer to have? Do you want to have roommates or live alone? 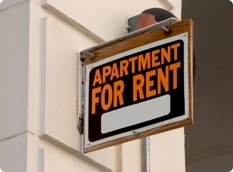 Are you interested in buying or renting an apartment? How long of a lease do you want? Are you willing to sublet? What's the maximum amount of money you can spend on housing? Some of these questions are easier to answer than others, and depending on what part of the country you're in, it might make the most sense to list a range rather than a fixed amount. Perhaps you'd be willing to spend a half an hour or less commuting from home to your job, and spend up to an hour traveling to friends or diversions if you can reduce your monthly rent. That reminds me: It's recommended that you limit your spending on rent or a mortgage to just one third of your income. Lots of people spend more than that, and that's a recipe for racking up credit card debt and other money problems. Save yourself the grief by not living beyond your means. A common mistake: Budgeting for half of one's income to go toward housing. It might seem do-able in the abstract, but in practice, monthly bills accumulate. Even when you get a raise at work, you quickly get accustomed to having the additional money and that means spending it. If you don't allow yourself enough funds for things other than housing, you might find yourself bouncing checks. If you don't have a tape measure already, now's a good time to invest in one. Measure your current home, and then use that as a point of reference to decide how much space you'd like for your new digs. Don't forget to include bathrooms, kitchens and hallways in your measurements. Also, measure your furnishings, which will not only inform your choice of size for the new apartment, but also tell you what to look for in the dimensions of hallways, stairwells or elevators – so you'll be able to move your belongings into the new apartment. Know, however, that asking realtors about the dimensions of apartments won't necessarily get you a simple answer. You might have to visit places and measure when you get there. Visiting apartments is really the best way to shop for a place. Written advertisements, interactive video tours and spoken spiels by realtors are never as informative as seeing the real thing. Finding a home does involve a lot of footwork, but it pays off when you find the perfect space that you can nest in.